1. I would love to go back and live my life knowing what I know now. If I had this ability I wouldn’t have let myself be influenced by others in elementary school and I definitely wouldn’t let the things they said to me affect me today (I’m working on it, but sadly it’s something I still struggle with). I also never would’ve dated this guy Matt (aka “the criminal”). The only time I ever dated solely on looks and I definitely paid for it. Another thing I would’ve done is go away to college. I would’ve liked to experience life on my own for a bit before getting married. Unfortunately, I choose to stay home and go to school, though. I was only a year into my relationship with my hubby, at the time, and didn’t want to leave him. I realize now that if we were meant to be we would’ve stayed together whether I went away to school or not. I’m sure there are also other things I would change, but those are the major things. 2. I want my daughter to have a long and happy life. I’d like her to be able to live to her fullest potential and have a lot of the struggles I’ve had to go through over the years. I can’t imagine most people wouldn’t wish this or something similar for their kid(s). 3. I would like to be financially stable. I don’t need to be rich…I just want to have enough money that I don’t ever need to have to stress out about money again. Bills get paid without worry, we can take the occasional vacation, etc. Money is the source of so much stress that it’d be nice to have that stress of my shoulders. So what about you guys? 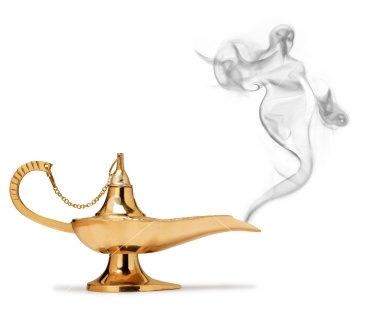 What would your 3 wishes be? I’d love to hear them!!! This post was written for the Ultimate Blog Challenge and The Blog Dare on Bloggy Moms. ~ by lisa pollard on July 9, 2011. 1. I wish I were magically, instantly physically fit like I was when I was a kid. I want to run and jump and move like I did when I was a kid. I want to be filled with energy from the moment I wake till when I go to sleep. And I want to sleep fully through the night – that deep, restful sleep that children have. 2. I’d like to not be afraid to be ‘wrong’. 3. I’d like my grown kids to have a positive, and deep relationship with their spouses – to feel like their spouse is their advocate & their best friend. I’d like both couples to actively serve God. I’d like them to encourage each other’s dreams. I want them to love being married. Great post! Reminds me of what I just wrote in a post tonight…except I had more than three and could go on…mine were just the basic…housekeeper, personal assistant, etc. If I had only 3 wishes….I would wish my son not be disabled so he could laugh and play and live life 2. My daughter to live a long life with a wonderful man someday 3. I live long enough to have grandchildren. Anyway…visiting from the MSA Alexa group. Make it a great week! 1. That all of my children will always love G-d and live their lives with the primary purpose of making it to His kingdom. 2. That my husband realizes just how much he means to me and how he has made my life beautiful with his love and sacrifices. 3. That I can somehow contribute, in a material way, to others in this world through my time and talents. Like insignificant at best on Facebook! Follow insignificant at best on Twitter!